The software runs on your server, in your premises. Unlike cloud-based systems, this means you are total control, and there are no opportunities for third parties to be attacked or subject to demands from government for inspection without your knowledge. A virtual deal room is a special kind of web application - sometimes known as a sharing portal - that allows files to be posted so that users from anywhere in the world can access them, in a controlled and secure manner. Virtual deal rooms - VDRs - have been big in large scale business transactions for many years, enabling large firms to easily share information in a secure way. Creating and installing virtual deal room software was so expensive that only the very largest of Enterprises could afford to do it. To make virtual deal room technology available to medium sized businesses a number of 'cloud based' services have come into being. Cloud services make many free services possible - from web-search to social networks, but cloud services run by third-parties are poorly suited to situations where security matters, or where the information being hosted is itself very valuable. In ordinary cloud services you do not know where your data is located, and you do not know who has access. You simply have to trust the provider. Based on a new development that enables every company, of any size to create their own deal room without any special technical knowledge or special equipment. VirtualDealRooms software installs into a standard Windows computers that you control so you have total control over data location and who can access your data 'behind the scenes'. 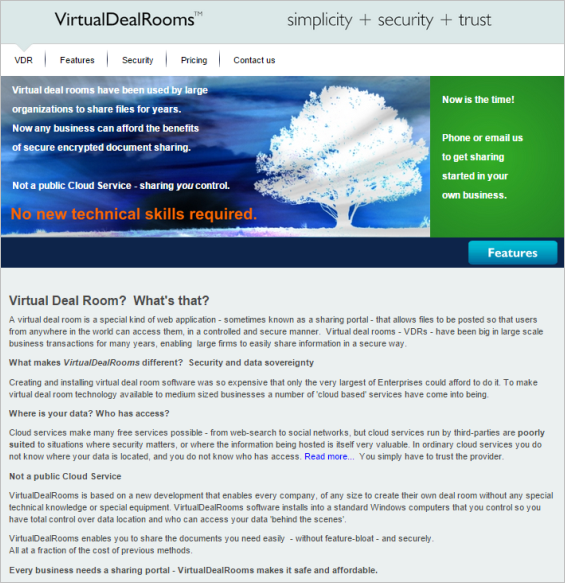 VirtualDealRooms enables you to share the documents you need easily - without feature-bloat - and securely. All at a fraction of the cost of previous methods. Every business needs a sharing portal - VirtualDealRooms makes it safe and affordable. Visit the Virtual Deal Rooms website to learn more and purchase a license for this software.